Create a Definition on your data source using the above code. Note that you’ll need to update the demo. schema to match how it appears in your data source. Intercom data typically syncs into a data warehouse with a table for intercom.conversation_parts and intercom.conversations. This Definition also uses a rollup table called demo.rollup_periods which has a record for every day. If you don’t have a rollup table, you can substitute any other table in your data source that will have a timestamp column with at least one record per day. Once you have the Definition set up, clone the dashboard by clicking “Clone” at the top. Once in the Editor, be sure to switch from the “Mode Public Warehouse” to your connected database. Then click run. When you click into the Report Builder, the dashboard will be ready and waiting, with your customer support data. Be sure to set a schedule so this dashboard refreshes each morning, and choose how you would like to distribute it to the team (via Slack, email, or embed, or present it on a TV). You can brand your dashboard using Mode themes. This report uses Mode Subway theme, but feel free to update it to your preferred look. Customers on the Plus Plan can also create custom themes to keep the dashboard on brand. 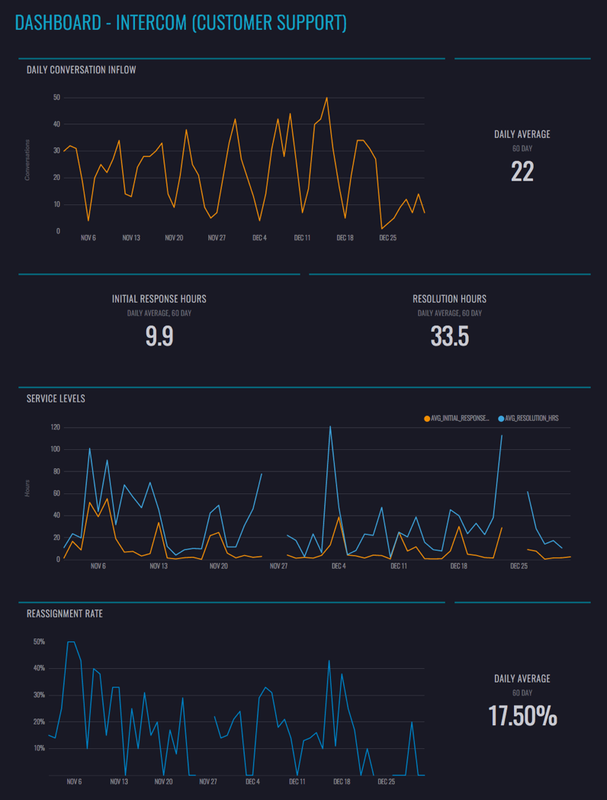 This dashboard is just the beginning of different ways you can analyze your Intercom customer support data in Mode. Using Mode’s Python notebook, create a customer support forecast. Join the @daily_support definition with your product data to understand what product events generate support conversations. Identify seasonal patterns and plan accordingly.